Is there anything more rock and roll than a hot gal with a big voice slashing power chords on Flying-V? 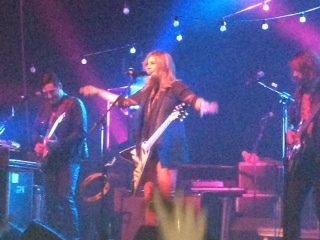 Last night my daughter and I saw Grace Potter and the Nocturnals at the legendary Minneapolis club First Avenue. I saw her a couple of years ago at Lollapalooza and she was great, but this was a proper gig – two hours of rock and roll heaven. Grace puts on a high energy show – channeling Janis Joplin and Tina Turner, yet a singer songwriter too. 24 hours later my ears are still ringing. I often forget how great rock and roll can be – you start to take it for granted. Then a performer like Grace Potter reminds you of how transcendent rock and roll can be: pure energy, sexual tension, joy, and raw aggression exploding on stage. This was night two of a two-night stand and comparing set lists I feel blessed to have picked night number two (both shows sold out). She played all her hits and spiced it up with some great covers. Of particular note was a rocked-out version of Prince’s “Kiss” – a special gift for the Minneapolis crowd. For her first encore she mashed up her hit “Paris (Ooh La La)” with Joan Jett’s “I Love Rock and Roll.” There are too few great female rockers; this was a wonderful nod to one of the greats who paved the way for Potter. I know it’s only rock ‘n roll but I like it, like it, yes, I do. This was as ROCK SHOW!